Mugello is very likely to be the happiest place on Planet Earth today. Valentino Rossi took a fine pole position for Yamaha during a thrilling qualifying session at his home race. Rossi was aided by the tow from soon-to-be 2017 MotoGP team-mate Maverick Vinales, that helped him set a blistering time of 1min 46.504sec at the track. 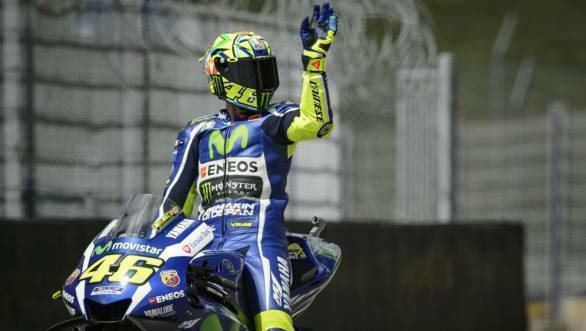 This is Rossi's first pole at Mugello since 2008. It wasn't Rossi who was the hot favourite for pole in Italy, though. Initially it seemed like the fastest man was going to be Ducati's Andrea Iannone. Iannone was fastest during free practice and claimed pole at Mugello in 2015. However there was nothing that could have prevented Rossi's pole, especially not when Suzuki's Maverick Vinales helped him along. It was Vinales who qualified second on the grid with a timing of 1min 46.598sec, with Iannone third. There was a potential threat from Repsol Honda's Marc Marquez, but with his RC213V acting up, the Spaniard could finish no better than fourth fastest. Starting alongside him on row two of the grid is Jorge Lorenzo. The second of the Suzukis, with Aleix Espargaro astride it, finished sixth fastest. The third row of the grid was headed by Dani Pedrosa in the second of the Repsol Hondas, with Bradley Smith in the Monster Yamaha Tech 3 eighth fastest, and Danilo Petrucci ninth fastest. Row four saw Scott Redding take tenth spot, with Michele Pirro and Yonny Hernandez eleventh and twelfth respectively. A decidedly disappointing qualifying session for Ducati's other rider Andrea Dovizioso, who will start down in 13th tomorrow. Also sharing the fifth row of the grid are Pol Espargaro and Hector Barbera. Row six sees Cal Crutchow, with Jack Miller and Eugene Laverty, while the seventh row of the grid has Alvaro Bautista, Stefan Bradl and Loris Baz. Tito Rabat will not start the race at Mugello, after his crash during practice left him with a broken collar bone that requires surgery.